Neuroimaging shows that astrocytes are responsible for joining the 2 halves of the brain together. A significant milestone in the evolution of the mammalian brain is the emergence of the corpus callosum, which is exclusively present in placental mammals. This commissure forms the largest axon tract in the human brain and is required for the integration of sensory, motor, and associative processes between the two cerebral hemispheres. In congenital absence of the corpus callosum, callosal axons often extend toward the midline, and are unable to cross. Callosal agenesis results, and a wide spectrum of neurological deficits, with the primary cause underlying this major brain malformation unknown. Now, a study from researchers at the University of Queensland identifies the cellular origins, using neuroimaging, of the corpus callosum, the 200 million nerve fibers that connect the two hemispheres of the brain. The team state their findings suggest that during development astrocytes, the main supporting cells of the brain, weave themselves between the right and left lobes, to form the bridge for axons to grow across the gap. The opensource study is published in the journal Cell Reports. Previous studies show that during development, callosal connections form between the cerebral hemispheres through a midline region that is formerly separated by a deep interhemispheric fissure. This structure is primarily composed of leptomeningeal fibroblasts and extracellular matrix. Given that the cellular composition of the deep interhemispheric fissure is distinct from the surrounding neuroepithelial tissue, a key unanswered question is how callosal axons navigate across this midline territory to form a tract. The current study shows that remodeling of the interhemispheric midline is an astroglial-mediated process that is crucial for corpus callosum formation during placental brain development. The current study utilises mice embryos and human brain neuroimaging to observe the growth of individual axons, in order to see how callosal axons navigate around this area to connect the hemispheres. Results show that the axons cannot grow through this gap, and instead grow down and around it to connect the two hemispheres of the brain. Data findings show that they rely on astrocytes to guide their path. The lab observed that astrocytes are initially located beneath the area filled with fibroblasts, however, during fetal development a molecular pathway signals the astroglia to migrate forward and mature, allowing them to weave together into a thick column along the center of the brain, which pushes back against the gap and causes it to shrink. Results show that this column of astroglia acts as a bridge for callosal axons and allows them to cross between the two sides of the brain. Data findings show that as this bridge grows, the gap between the hemispheres shrinks until only a small portion of it remains, and the corpus callosum begins to form. The group state that when there was an issue with molecular signaling, the astroglial cells didn’t change into multipolar cells, which prevents the formation of the callosal tract and resulted in callosal agenesis. The researchers explain that this midline area is one of the first places in the brain that exhibit these astroglial cell changes, and if these cells don’t make this transition, the remodeling process to form the corpus callosum doesn’t get started. They conclude that they’ve finally discovered one of the major causes for this group of disorders. The team surmise that their findings show how astroglia remodel the telencephalic interhemispheric fissure during mouse and human development. They go on to add that further evidence demonstrates that defects in interhemispheric remodeling underlie callosal agenesis in mice and humans. For the future, the researchers state they now plan to use this knowledge to help make better diagnostic tests for callosal agenesis. The corpus callosum is the major axon tract that connects and integrates neural activity between the two cerebral hemispheres. Although ∼1:4,000 children are born with developmental absence of the corpus callosum, the primary etiology of this condition remains unknown. Here, we demonstrate that midline crossing of callosal axons is dependent upon the prior remodeling and degradation of the intervening interhemispheric fissure. This remodeling event is initiated by astroglia on either side of the interhemispheric fissure, which intercalate with one another and degrade the intervening leptomeninges. Callosal axons then preferentially extend over these specialized astroglial cells to cross the midline. 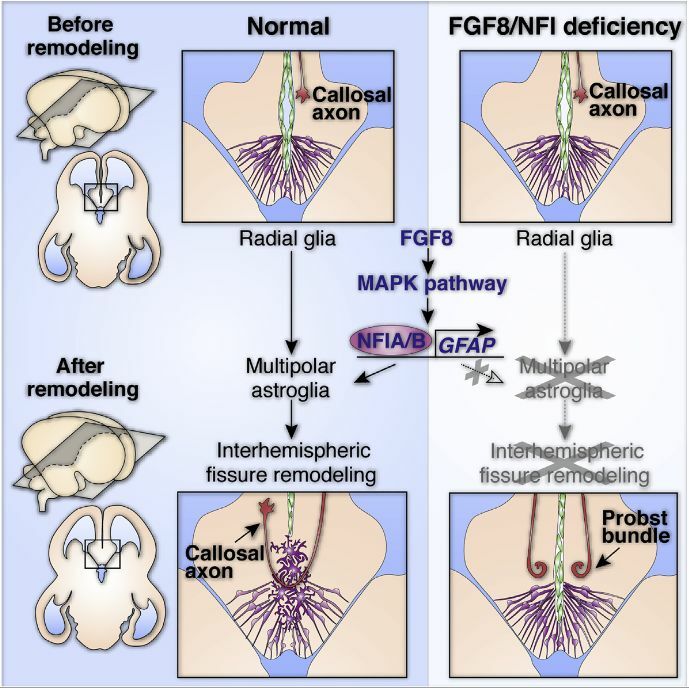 A key regulatory step in interhemispheric remodeling is the differentiation of these astroglia from radial glia, which is initiated by Fgf8 signaling to downstream Nfi transcription factors. Crucially, our findings from human neuroimaging studies reveal that developmental defects in interhemispheric remodeling are likely to be a primary etiology underlying human callosal agenesis. Astroglial-Mediated Remodeling of the Interhemispheric Midline Is Required for the Formation of the Corpus Callosum. Richards et al 2016.